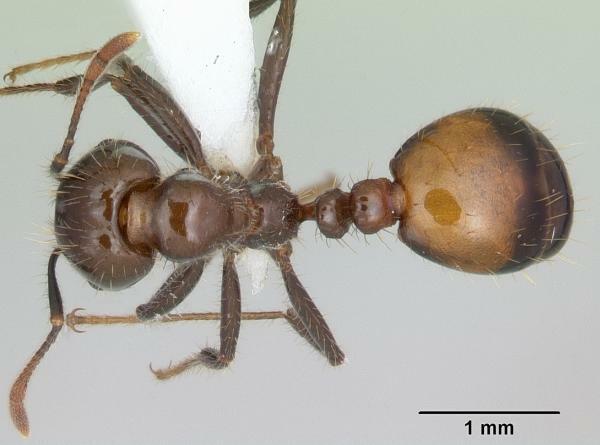 Solenopsis richteri, commonly known as the black imported fire ant, is native to South America. It builds large mounds that can reach 46cm in height. Solenopsis richteri damages crops, impedes recreational activities and can undermine roads and asphalt. It is also very dangerous to those who experience anaphylaxis from the venom of its bite. Eradication of Solenopsis richteri is not an option. It can be controlled but this is an ongoing process..
University of Tennessee (2004) states that, \"S. richteri is darker at the end and has golden patch at the top of the gaster defined by distinct dark outlines. This species has a ten-segmented antenna with a two-segmented club, and a two-segmented waist. O'Keef and Vinson (2002) report that, \"S. richteri has a median clypeal tooth and a striated mesepimeron. Other characters that might help in the identification include: 1) the antennal scape nearly reaches the vertex, 2) the post-petiole is constricted at back half, and 3) the petiolar process is small or absent.\"
Lockley (1996) reports that, \"One of the identifying characteristics of a S. richteri colony is the earthen nest or mound. The mound is a conically-shaped dome of excavated soil that has a hard, rain-resistant crust. The mound averages 0.40m in diameter and 0.25m in height. In heavier soils, a mound can exceed 1m in height and 1.5m in diameter. There are usually no external openings in the mound; tunnels approximately 25-50mm below the surface radiate from the mound allowing foraging workers ready egress and ingress.\"
Please click on AntWeb: Solenopsis richteri for more images and assistance with identification. 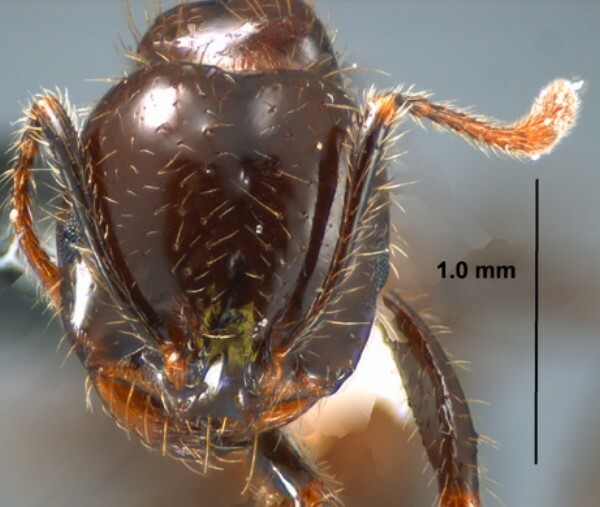 The AntWeb image comparison tool lets you compare images of ants at the subfamily, genus, species or specimen level. You may also specify which types of images you would like to comare: head, profile, dorsal, or label. 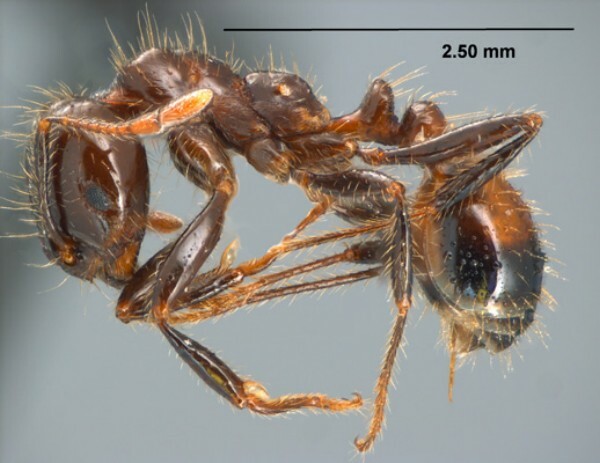 The National Park Service (2003) states that, \"The black imported fire ant, S. richteri, is very similar to the red imported fire ant (S. invicta). It is currently limited to a small area of northern Mississippi and Alabama. It may be displaced from established habitats by S. invicta. Scientists have long thought that the black and red fire ants were two distinct species. Recently it has been discovered that hybrids of these ants produce viable offspring, and some scientists now wonder whether they are simply two races of the same species, varying in colour and perhaps behaviour.\"
TIFARMP, (UNDATED) states that, \"Colonies frequently migrate from one site to another. The queen needs only half a dozen workers to start a new colony. They can develop a new mound several hundred feed away from their previous location almost overnight. Flooding causes colonies to leave their mounds and float until they can reach land to establish a new mound. Colonies also can migrate to indoor locations.\"
TIFARMP (UNDATED) notes that, \"Worker S. richteri are wingless, sterile females. They protect the queen by defending the nest from intruders, by feeding the queen only food that the workers have eaten first, and by moving the queen from danger. They also forage and care for the developing brood. The brood is made up of cream-coloured eggs, larvae, and pupae of all the castes. The winged forms, or reproductives, live in the mound until their mating flight, which usually occurs in the afternoon soon after a rainy period. Mating flights are most common in spring and fall. Males die soon after mating, while the fertilized queen alights to find a suitable nesting site, sheds her wings, and begins digging a chamber in which to start a new colony. Sometimes, several queens can be found within a single nesting site.\"
TIFARMP (UNDATED) state: \"S. richteri builds mounds in almost any type of soil, but prefers open, sunny areas such as pastures, parks, lawns, meadows and cultivated fields. Mounds can reach 18 inches in height, depending on the type of soil. Often mounds are located in rotting logs and around stumps and trees. Colonies also can occur in or under buildings.\" The National Park Service (2003) states: \"Increasingly, S. richteri have been found nesting in wall voids, around plumbing, and under carpeting in structures. The ants have also been found invading outdoor electrical equipment, apparently attracted to the electrical fields. Infested sites include household electric metres, traffic signal control boxes, and even airport runway lights.\"
TIFARMP (UNDATED) state that, \"A newly mated queen lays about a dozen eggs. When they hatch 7 to 10 days later, the larvae are fed by the queen. Later on, a queen fed by worker ants can lay up to 800 eggs per day. Larvae develop 6 to 10 days and then pupate. Adults emerge in 9 to 15 days. The average colony contains 100,000 to 500,000 workers and up to several hundred winged forms and queens. 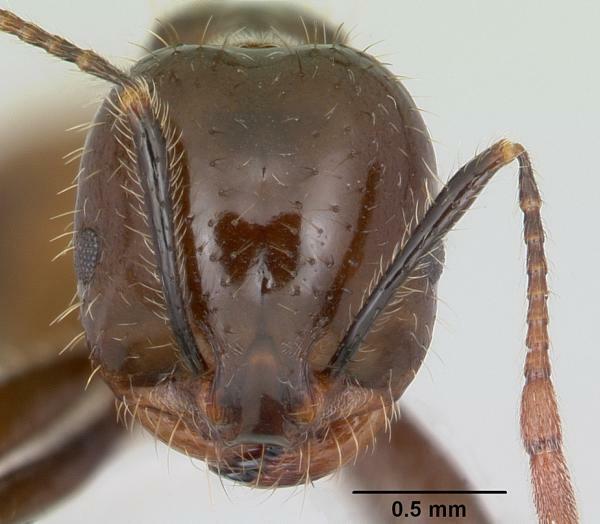 Queen ants can live 7 years or more, while worker ants generally live about 5 weeks, although they can survive much longer.\"
Recommended citation: Global Invasive Species Database (2019) Species profile: Solenopsis richteri. Downloaded from http://www.iucngisd.org/gisd/speciesname/Solenopsis+richteri on 21-04-2019. For a summary of the general impacts of invasive ants, such as their affect on mutualistic relations, the competitive pressure they impose on native ants and the effect they may have on vulnerable ecosystems please read this document: Invasive ants impacts . The National Park Service (2003) states that, \"S. richteri damage crops such as soybeans, eggplant, corn, okra, strawberries, and potatoes by feeding directly on the plants or by protecting other insects that damage the crops. They chew the bark and growing tips of citrus trees and feed on the fruit. Fire ant mounds interfere with farming and mowing operations and turn recreational fields into disfigured moonscapes. Fire ants have caused sections of roads to collapse by removing soil from under the asphalt.\" Holloway and Smith (UNDATED), \"Fire ants can be a problem in citrus by tending insects that secrete honey dew which in turn provides a medium for sutty mold. These ants can damage tree bark and provide an entry way for disease causing organisms. Because of the ability to sting fire ants are often a nuisance to citrus production workers. 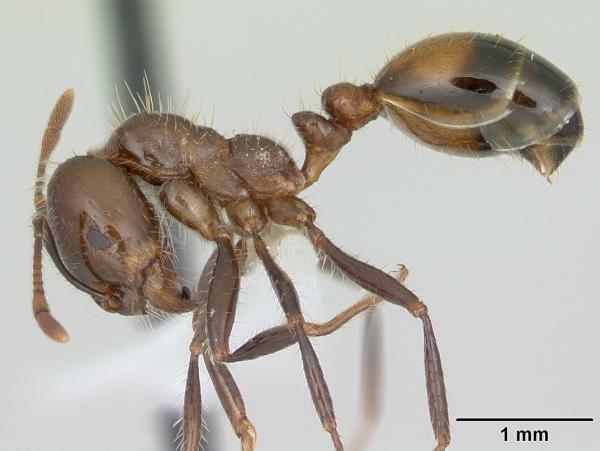 Species include the tropical fire ant, Solenopsis geminata, along with the imported fire ants, Solenopsis invicta and S. richteri\"
DeShazo et al. (2004) state: \"The clinical signs of massive fire ant stings relate to the biologic activity of the ant venom, which possesses hemolytic, neurotoxic, and cytotoxic activity; inhibits sodium and potassium adenosine triphosphatases; reduces mitochondrial respiration; uncouple phosphorylation; adversely affects neutrophil and platelet function; inhibits nitric oxide synthetase; and perhaps activates coagulation. These properties predispose to a hypercoagulable state and exacerbate any allergic symptoms experienced by patients who are attacked.\" DeShazo et al. (2004) report various incidents of death or serious injury resulting from S. richteri attacks: \"Infants, the elderly, and others who experience anaphylaxis from the bite. Both infants and elderly have been killed because of complications resulting from the attack. A peculiar amount of cases that occur within health care facilities, primarily nursing homes, with subsequent massive sting attacks on patients with impaired consciousness.\"
Please see Solenopsis richteri information sheet for more information on biology, distribution, pest status and control technologies. For details on management of this species including preventative, physical, chemical and biological control please read our pdf file on management information. Solenopsis invicta virus-1 (SINV-1) was detected in S. richteri and S. invicta/richteri hybrid (Valles, 2007). Informations on Solenopsis richteri has been recorded for the following locations. Click on the name for additional informations. Deshazo R. D., S. F. Kemp, M. D. deShazo, and J. G. Goddard. 2004. Fire Ant Attacks on Patients in Nursing Homes: An Increasing Problem. Am J Med. 2004;116:843-846. Goddard, J., J. Jarratt, and R. D. Deshazo. 2002. Recommendations for Prevention and Management of Fire Ant Infestation of Health Care Facilities. Southern Medical Journal 95(6): 627-633. National Park Service. 2003. Integrated Pest Management: Manuals: Fire ants. United States Department of the Interior. Palomo, G., P. Martinetto, C. Perez, and O. Iribarne. 2003. Ant predation on intertidal polychaetes in a SW Atlantic estuary. Mar Ecol Prog Ser Vol. 253: 165-173. Simberloff, D., and L. Gibbons. 2004. Now you see them, now you don t! - population crashes ofestablished introduced species. Biological Invasions 6: 161-172. TIFARMP (Texas Imported Fire Ant Research and Management Project). UNDATED. Ant Facts. UACES (University of Arkansas Cooperative Extension Service). 2004. Fire Ant Treatment Methods Managing Imported Fire Ants in Urban Areas - MP426. University of Arkansas, Division of Agriculture, Cooperative Extension Service. Baird, R., Woolfolk, S. & Watson, C.E. (2007). Survey of Bacterial and Fungal Associates of Black/Hybrid Imported Fire Ants from Mounds in Mississippi. Southeastern Naturalist 6(4): 615-632. ITIS (Integrated Taxonomic Information System). 2005. Online Database Solenopsis richteri. Lockley, T. C. 1996. Imported Fire Ants. Imported Fire Ant Station, USDA/APHIS/PPQ. University of Minnesota. Mississippi State University. 2004. Insects: Fire Ants. MSUcares (Coordinated Access to the Research and Extension System). Morrison, L. W., S. D. Porter, E. Daniels, and M. D. Korzukhin. 2004. Potential global range expansion of the invasive fire ant, Solenopsis invicta. Biological Invasions 6: 183-191, 2004. O Keefe, S. T., and S. B. Vinson. 2002. Texas Fire Ant Identification: An Illustrated Key: Fire Ant Plan Fact Sheet #013. University of Tennessee. 2004. Imported Fire Ant Identification: Three Types of Imported Fire Ants. Agricultural Extension Service. Valles, S.M., Strong, C.A., Oi, D.H., Porter, S.D., Pereira, R.M., Vander Meer, R.K., Hashimoto, Y., Hooper-Bu, L.M., Sanchez-Arroyo, H., Davis, T., Karpakakunjaram, V., Vail, K.M., Graham, L.C., Briano, J.A., Calcaterra, L.A., Gilbert, L.E., Ward, R., Ward, K., Oliver, J.B., Taniguchi, G. & Thompson, D.C. (2007). Phenology, distribution, and host specificity of Solenopsis invicta virus- 1. Journal of Invertebrate Pathology 96: 18�27.